Hiya guys! I've had a long few days and I do mean that in every regard. My insomnia has just kicked up a notch in the worst way possible. I sleep maybe three hours a night. All I can seem to do is think about polish... hmm... maybe I have a problem. Nahhh. No such thing as a polish problem, but while we're on the topic of polish let me enable you some more. 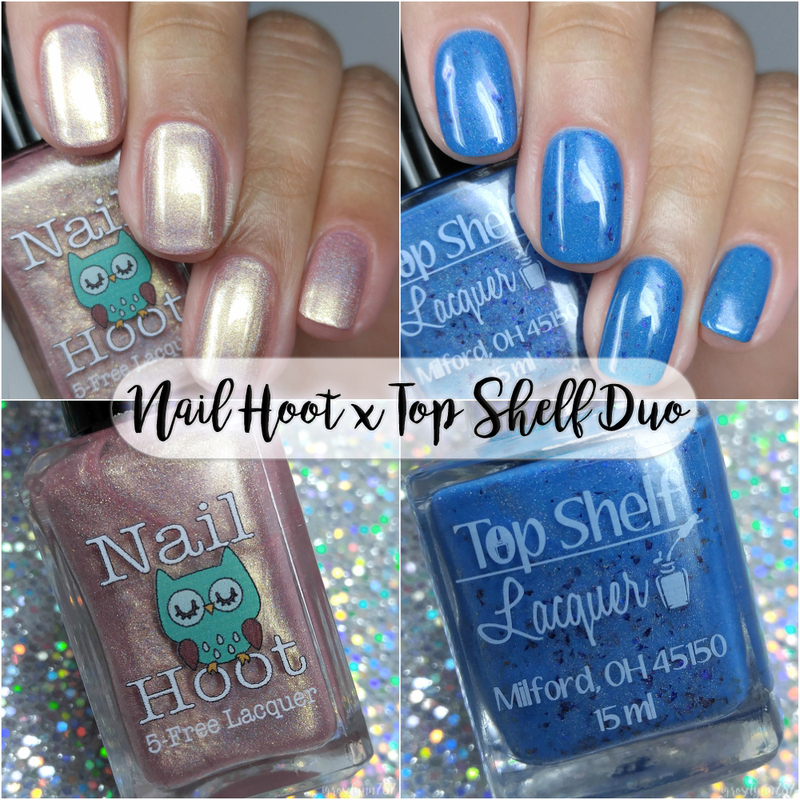 (That smooth transition though XD) Today I'm sharing swatches for the Collaboration Duo by Nail Hoot and Top Shelf Lacquer. A little backstory on how this dream team joined forces, Brandie had a naming contest in her group and Amy suggested the name "Hoot This Way". For every contest after that, Amy continued to submit "Hoot This Way" as her entry. Brandie finally told Amy she would name a polish "Hoot This Way" if Amy let Brandie name a polish, and the pair launched their polishes as a duo. Now enough of the talking, let's get right to the swatches! The Collaboration Duo by Nail Hoot and Top Shelf Lacquer is now up for purchase. There are 25 sets available immediately, after that pre-order will be open until August 15th. The 15mL duo retails for $18 (plus shipping). International shipping is also available. Hoot This Way can be described as a rose gold linear holo with strong gold flash. I don't know about you guys, but I'm still riding high on the rose gold train. I cannot get enough of it! And this shade is a stunning polish to any collection, but especially those who share my passion for rose gold. It's such one of those rare hues that is effortlessly classy AF. I could be wearing this while I am strutting in my pajamas and still feel like a total queen, haha. The formula has a sheer application with a fantastic build-up. Consistency wise it's very well balanced, not too thick or too thin. There are minimal brush strokes in the finish that mostly blend out after topcoat. Shown here in two coats and sealed with a glossy topcoat. Drunk and Disorderly can be described as a medium blue crelly with scattered holo, subtle purple shift, and color-shifting chameleon flakies. The formula has a sheer application that builds-up opacity really nicely. It has a thin consistency, but it ends up working well here to distribute the flakies without clumping. Very smooth to layer and work with. I'd also like to note that I experienced no staining on removal, which is always nice to know about a blue shade. Shown here in two coats and sealed with a glossy topcoat. Overall I have to say both of these shades are completely to die for. Both makers did a fantastic job in terms of formulas and color selection. These work really well as year-round shades and are a total must have for any collection. I definitely want to see more collaborations between these two in the future, maybe a monthly series? Help me build the hype XD. But tell me what you think guys, which one is your favorite? To recap, Collaboration Duo by Nail Hoot and Top Shelf Lacquer is now up for purchase. There are 25 sets available immediately, after that pre-order will be open until August 15th. The 15mL duo retails for $18 (plus shipping). International shipping is also available. Drunk And Disorderly is so pretty!